Last week Johan Cruijff turned 60. You probably know him as a soccer player, but he also made some records. His main claim to fame is a 45 in the hoempapa-genre, a song written and produced by Peter Koelewijn: Oei, oei, oei, dat was me weer een loei . 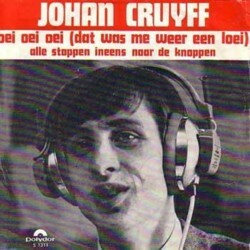 A true horrible song that nobody would care to listen to if it was not sung by Johan Cruijff. He also recorded a song while he played for Barcalone, in Spain, but I have no copy of that record. So today you get Oei, oei, oei. The anniversary of Johan Cruijff is a good excuse to mention Willem Vleeschouwer once again. 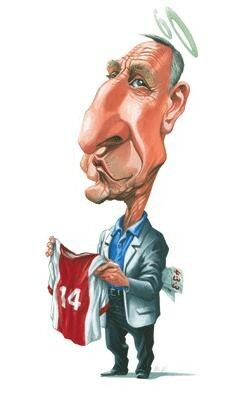 He made a beautiful painting of Cruijff for Panaroma, a Dutch magazine. Apart from the two 45´s that Johan Cruijff recorded himself, there are many songs about him. I have no idea how much exactly, but more than 50 made in Holland alone for sure. The musical quality of these songs is even beyond my limits, but if you are from Holland, a soccer fan and a record collector, you happily accumulate these records. I am thinking about selling large parts of my collection before the year is over, so if you ever come across records in this Soundtrack that you desperately want to have, make me an offer I can’t refuse.